Overseas Filipino Workers (OFWs) should be careful when asked for legal services, advice or opinion from people they barely know. This is after some OFWs have been deceived by a fake lawyer for their annulment proceedings. 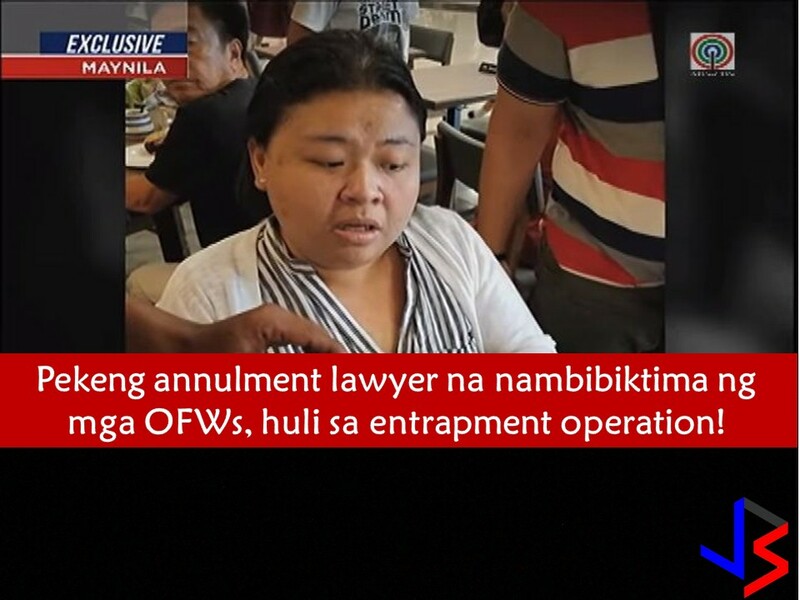 The fake lawyer was arrested in an entrapment operation by Manila Police District-General Assignment Section (MPD-GAS) after five people file a complaint against her. The suspect is identified as Susan Yance, who used the name of a real lawyer, Alice C. Villanueva. According to ABS-CBN report, the suspect pledged her victims with quick annulment proceedings for the only P200,000 but she managed to scam up to P500,000. In the report, Yance's victim claimed that reached her through Facebook using a real attorney’s name with account “@annulmentexpertph”. She has a website also, Philippine Annulment Process. It is stated on her website that she wants to help OFWs who deceived by their lawyers into getting a divorce abroad and pass it off as legal and binding in the Philippines. According to the real Atty. Alice C. Villanueva, she was shocked that someone is using her name. Court of Appeals said Yance managed to get her IBP number. One reason why she can convince her victim that she is legit. Manila Police District said Yance was able to victimize more than 15 victims and many of these are OFWs. MPD investigation disclosed that Yance was a law student before and a former call center agent. When arrested, the suspect confirmed she is not a lawyer but studied law. She is now facing large-scale estafa, falsification of public documents, and identity theft.